I love Sundays, especially early in the morning, when no one is really awake. They’re so peaceful and simple. 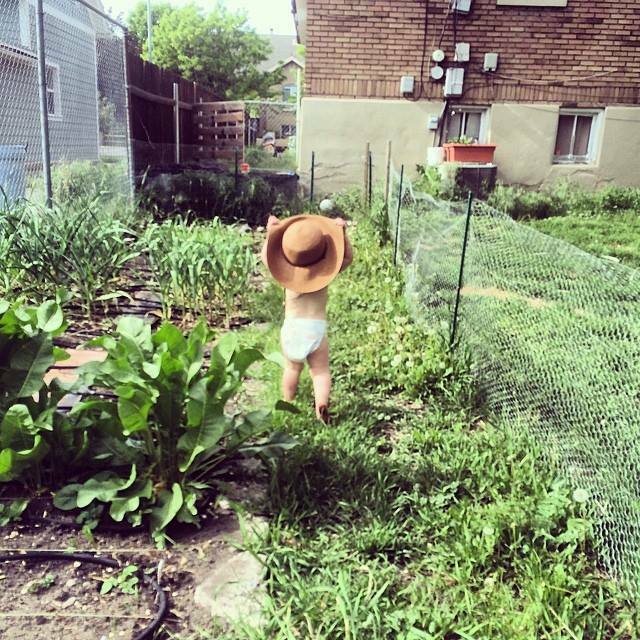 Noli and I went out this morning to check on the garden and make sure everything was going well, here’s an update on everything we are growing! Basil: I wasn’t thinking and didn’t harden it off. Dummy. Soooo, it’s growing still, but it’s looking a little rough. But I think it’ll be fine. I might pick up a few plants just to be on the safe side. You can never have too much basil! Beets: Attacked by the Spanish Leaf Miners. *insert crazy gardening lady with clippers and a spray bottle filled with soapy water*. Good news, although the leaves might look a little rough, the roots themselves are good and growing strong! Cantaloupe: Still no sign..I didn’t keep track of when I planted it, although it was the same time as corn. (2 weeks ago?) I’ll give it a few more days and replant it. Carrots: Carrots, you never fail me. You are delicious. I love you. (They are growing amazingly well, of course). Celery: I’m not sure how this is going. It’s growing. It’s small..there’s no guarantees it’ll make it. I’m not placing any bets. 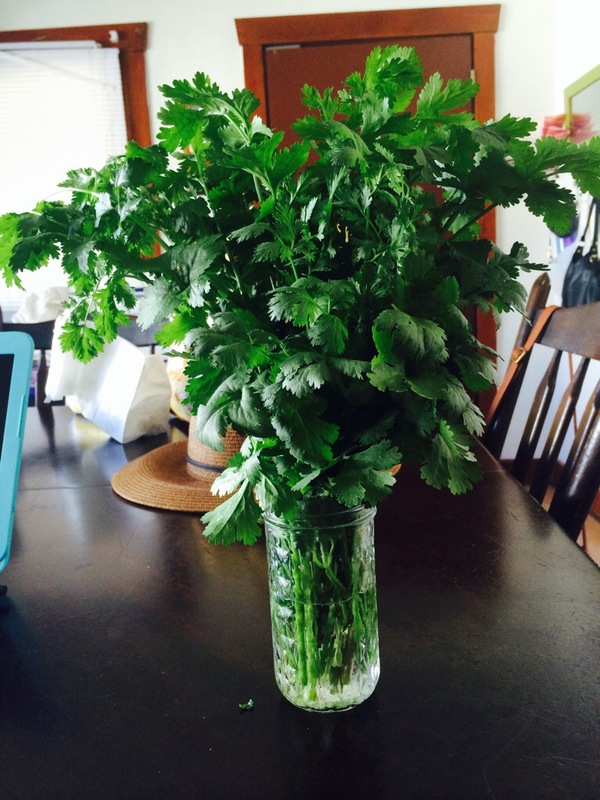 Cilantro: Harvested 3 HUGE bunches of this. We cut back the plants to the base and are waiting for more to sprout before it gets to hot and bolts. Corn: It has started to pop up! Thank goodness! I felt like that took forever! Something about growing corn makes me feel like a real farmer. Garlic: Everything is looking good so far. This is definitely one of the harvests I’m looking forward to most. Unfortunately we had to harvest one a little early (someone, or some furry black dog named Charlie, stepped on it). 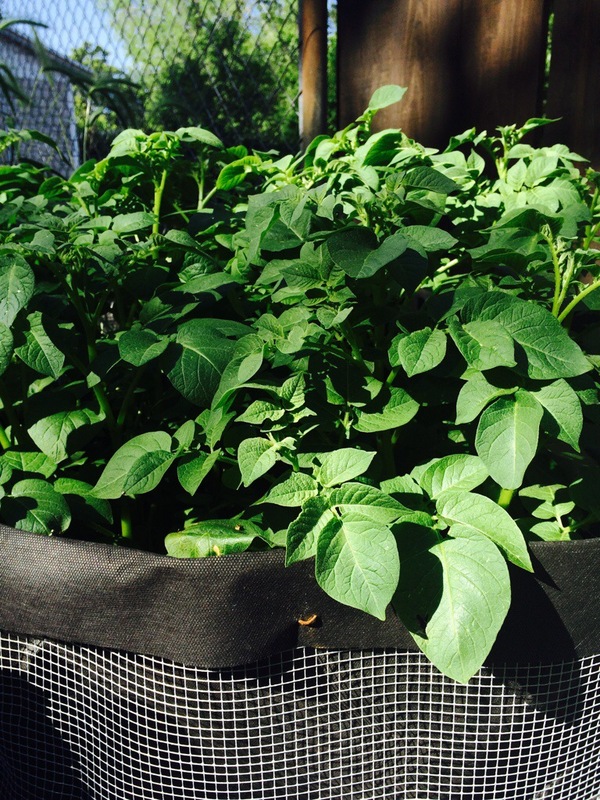 Green Beans: I started these outdoors last-minute, in a spot that wasn’t even intended for anything. But they are growing great and I’ll be glad I planted them. Horseradish: My one regret, NEVER GROW HORSERADISH IN ANYTHING BUT A CONTAINER. They will take over and conquer. The good news is, horseradish is delicious. Hubbard squash: This beautiful plant has popped up and is looking strong and handsome. Has anyone else grown it? If you like pumpkin pie, grow this. Pumpkin doesn’t hold a candle to Hubbard. Kale: Kale is doing beautifully, already harvested 3 HUGE bunches. Potatoes: Wowee. These guys. They sure know how to grow. Handsome little taters. 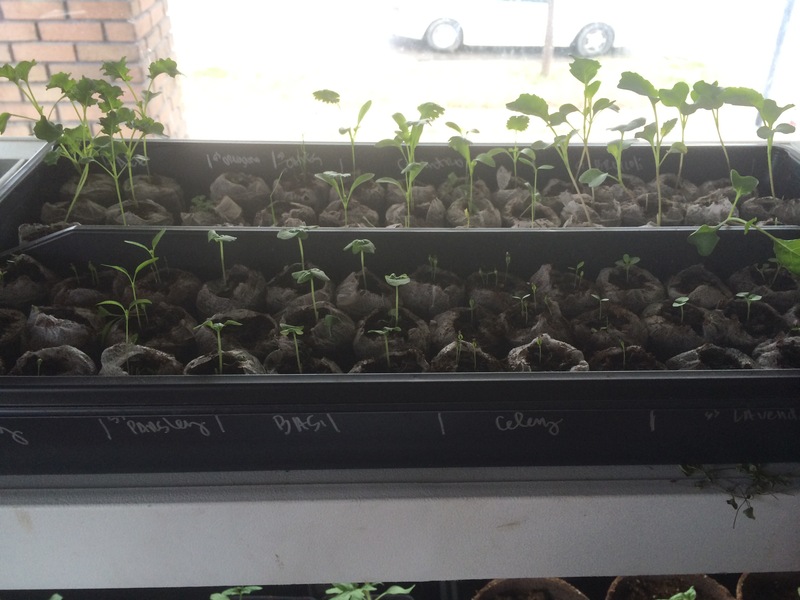 Snow Peas: Growing STRONG, but….it’s getting hot. Like really hot. So I don’t think they’re going to be very tasty. But we’ll see! Spinach: Damn Spanish Leaf Miners.. but overall it’s been a good harvest so far. Probably about 2 big bunches/or 3 salad bowls full (I’m going to get a better system down this week). Strawberries: I’m so glad we have strawberries. If you don’t have berries in your garden, you need to get some. Your gardening life will never be the same. I think next year I’m going to double and/or triple our strawberry plants. 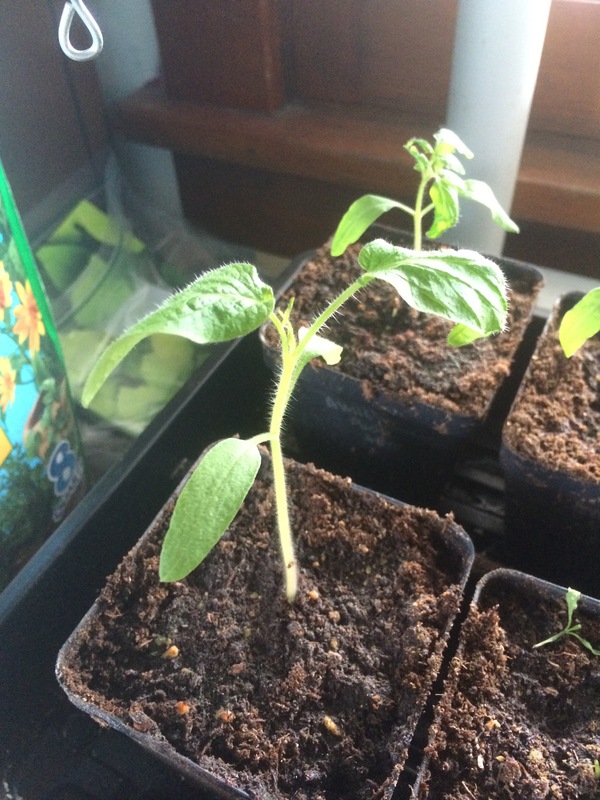 Tomatoes: This year I started my tomatoes indoors, and although they did great in the beginning, they became spindly from lack of strong light (we were using shop lights). Next year I’ll definitely build a mini green house, just for the tomatoes and peppers. I think they will do fine since we re-planted some of them sideways to give them more roots. A few we left as is to see if it made any difference. (8 in total). AND they are flowering which is a good sign! Zucchini: I bought an heirloom plant of this about a week or so ago. I didn’t think I wanted zucchini this year, but when I went to the store and had to pay .69 cents for ONE zucchini squas. I about died, and immediately put a plant in the ground. Things I wish I had room for: Cucumbers, broccoli and raspberries. And about a billion other plants. But these were the top 3. Is anyone keeping track of their harvest this year? I decided to see how much money I’m saving this growing season and I’m keeping track of the number and weight of my produce! So far I’ve harvested: 1 lb of organic spinach ($4.12 per lb), 10 oz of organic garlic scapes ($7 per 1/2 lb), 1 lb 8 oz of organic cilantro ($1.46 a bunch), 3 lb of organic kale ($1.97 a bunch), 1 German Red organic garlic head ($3.50 ea), and 3 organic strawberries! And…I’ll end with a few pictures! 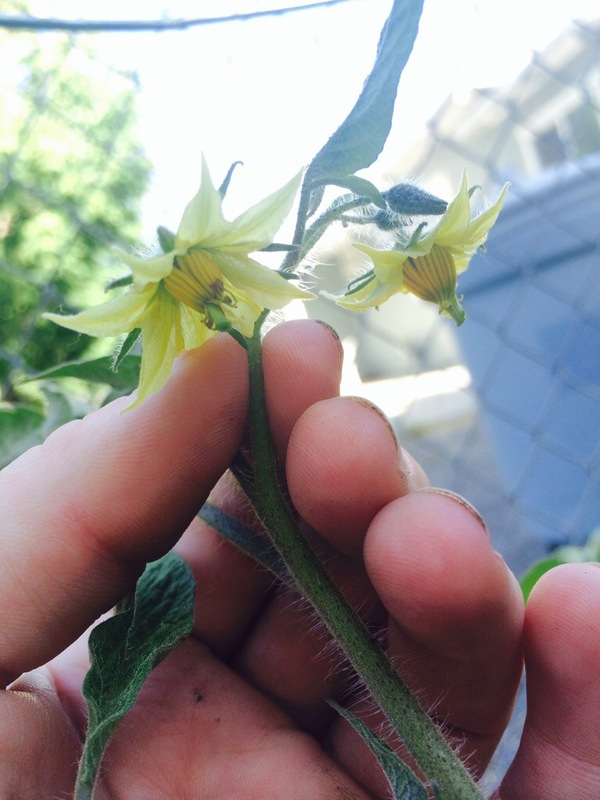 Hey tomato flowers, lookin’ goood! My daughter already ate all the partially ripe berries. She knows what’s up. Had to harvest this guy early, got trampled. Not sad one bit! Whew. It’s been awhile. Sorry about that guys. This year has been a tough year getting things going, I have a million things going on! It’s also an especially warm winter here in Utah so it’s been throwing my growing groove off. Do people still say groove? groove. I’ve had some up and downs. I tried soil blocking under the pretense that there was a good chance I would fail the first year. And I did. I got the blocks to form beautifully, and I even followed a recipe. I hate following recipes. But, I did anyways, and after the first few days in their little hut they started to smell STRONGLY of ammonia. Not a little ammonia. But like someone pee’d on it and stuck a plastic cover over it for a few weeks. I’ve read a few reviews on how you are supposed to let your soil blocking mix sit for a month to break down before you use it, so I’m going to try that and test it out. 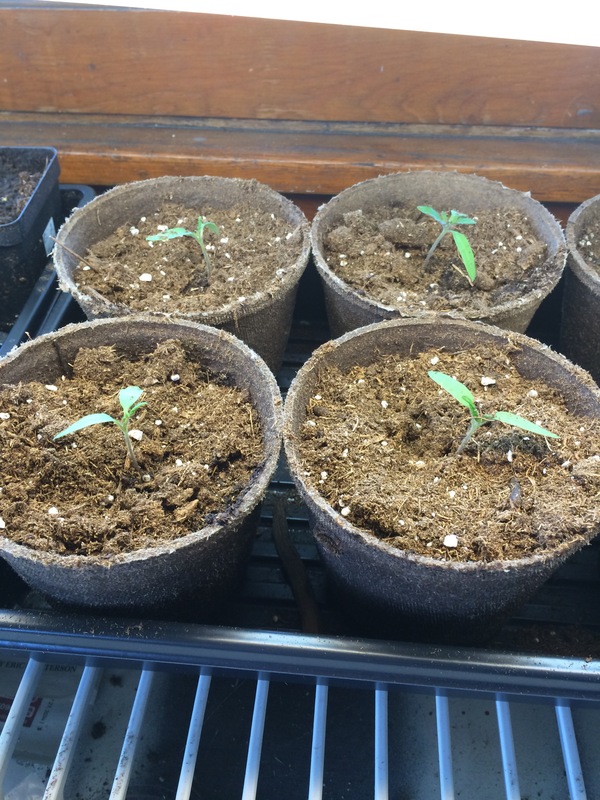 In the mean time, I’ve already gotten my seeds going in a pre-made seed starting potting mix, and they are chugging along quite nice. Chugging…why do I keep saying weird things? 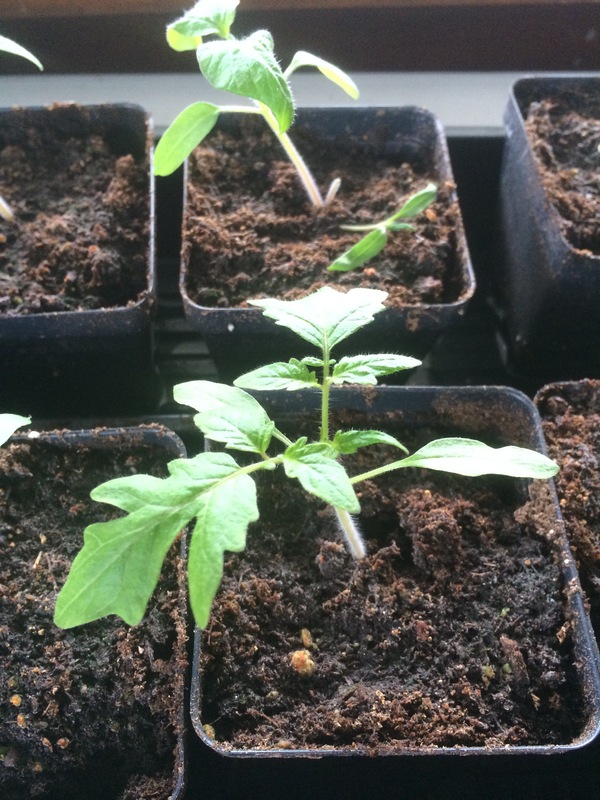 My tomatoes have formed true leaves and I’ve transplanted a few of the extra sprouts into their own container. Which, holy smokes, I thought I had lost them. With in 10 min they were flat on their backs and weaker than a candle in the wind. But with in a few hours they were back to their upright positions. Tip I learned: DO NOT GRAB BY THE STEM, only by the leaves. The stem is very sensitive and can be easily shocked. And here they are now, a few weeks later. Lookin’ good ladies! (And gents..) I’ve also been giving them a few tablespoons of fish fertilizer once a week, and it’s been a great thing! Especially for the tomatoes that had some shock. Sorry for the blinding light, but here are a few other things I’m growing so far: kale, oregano, chives, cilantro, broccoli, celery, parsley, basil, lavender and peppers. I definitely started the kale and broccoli a couple of weeks to early. 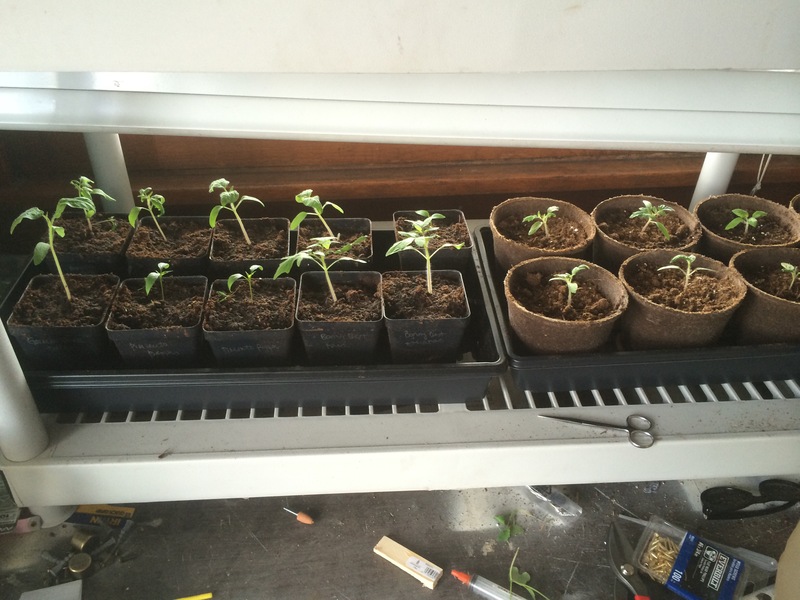 So I’m going to try and transplant them outside and put covers over them till it’s a bit warmer out. I spent all yesterday working on our strawberry patch, removing the old mulch, weeding, and removing some of the strawberry plants that died. There are a few things that I’m going to do differently this year/next year. 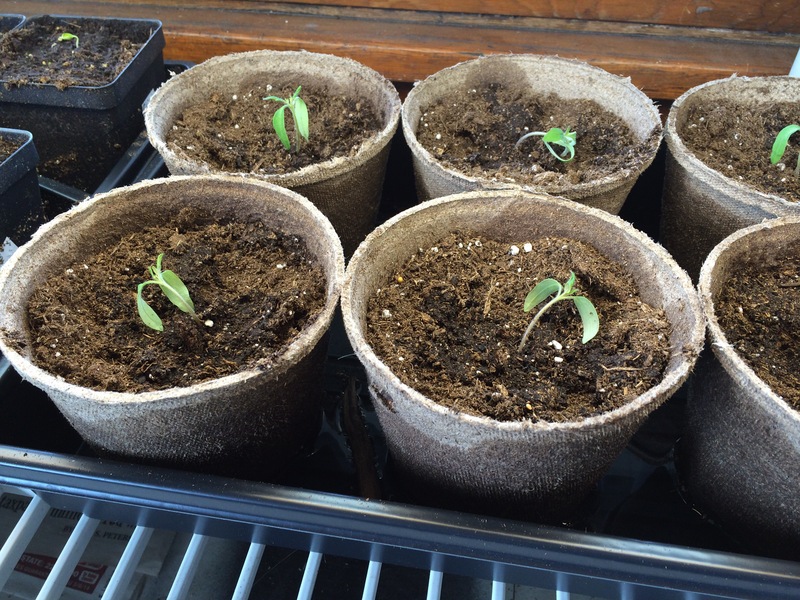 1) Transplant some of the runners after the last harvest, that way that are in their semi-dormant phase. Yesterday, I removed some of the plants that were to close to each other and tried to replant them. I think they will be fine, but it took a tole on them. 2) Their roots are sensitive to moisture and light, so I’ll be more careful not to lay the bare roots out while I’m working on getting them replanted. 3) This year I want to fertilize them more. My strawberries did great last year, but I think they will really benefit from the fertilizer. Tip: 1 lb of balanced fertilizer per 100 sq feet. With that water an inch per week throughout the growing season. Over the next 2 days I’ll be planting my lettuces, spinach, carrots, peas and potatoes! I’m a couple weeks behind on the peas, so we’ll see how well they do. Also, I’m growing potatoes for the first time this year. What is your preferred growing method? I’m short on space, so I was thinking about building some wire potato cages out of thick wire fencing. If you have a method that works, please share! Overall, I think this is going to be a great growing season and I can’t wait to see what everyone else is doing and growing! Let’s talk about winterizing. A lot of people, including myself, thought you could just let the garden go once you collected all you wanted from the garden. But I’ve realized over time that it would be like having a one way friendship with someone, it just doesn’t work. By composting all your left over annual plants and vines it prevents the build up of diseases. Cleaning out your annuals gives you a chance to build up your compost and get some great dirt filled with nutrients for next year’s garden. This is about half of the garden scraps we have so far. 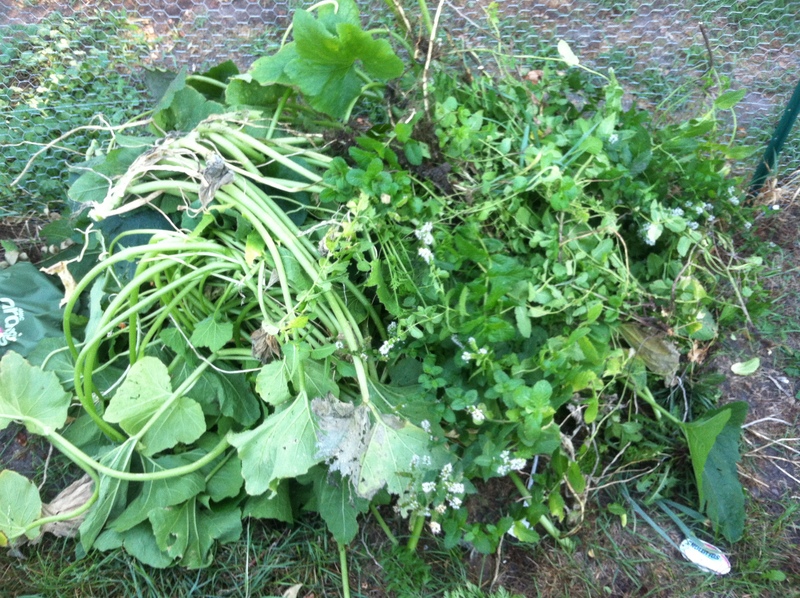 All going into our compost bin! This was my first year growing strawberries and it was such a fun experience. We had about 20 plants that produced all summer and are still producing a few berries today! 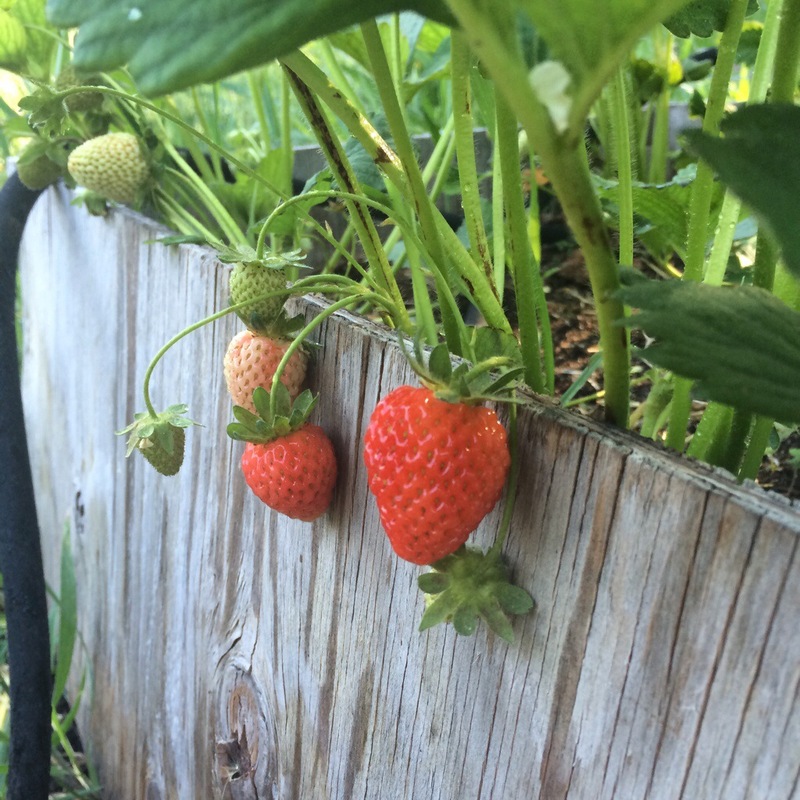 JUNE BEARING STRAWBERRIES: One/two weeks after they have stopped baring fruit take a pair of scissors or use a lawnmower and go over your berry plants to cut them back. This will help increase your production for the following year. 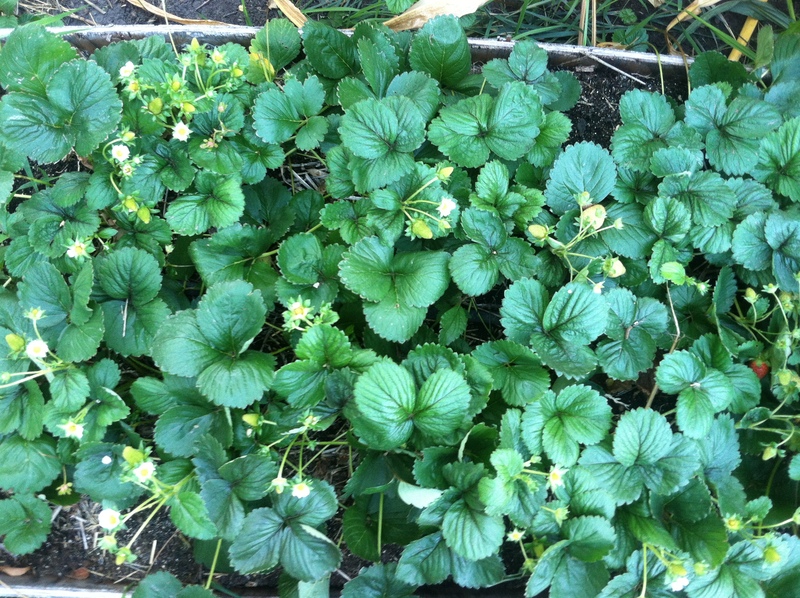 EVER BEARING STRAWBERRIES: I’ve heard of a few people that will cut their berries back the same way they do their June Bearing plants, but most people recommend leaving them be. But make sure you cut off all the runners and replant them or compost them. 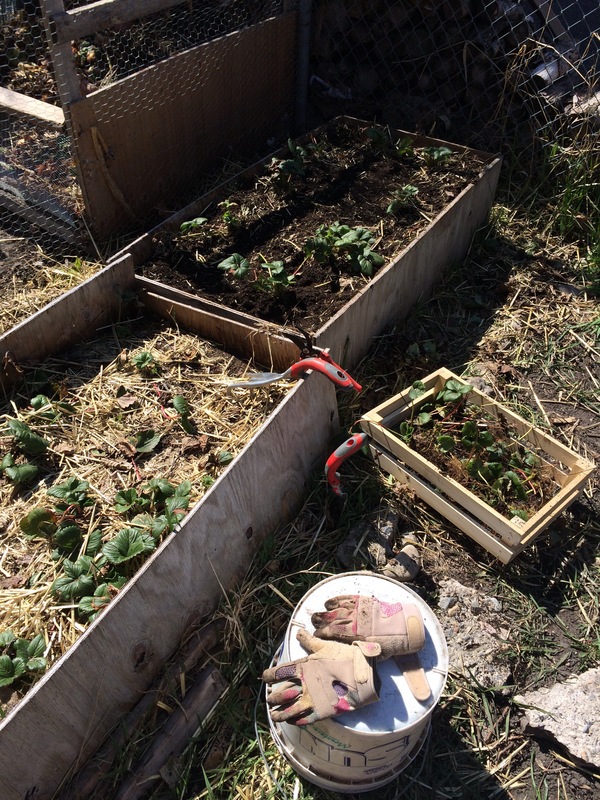 FOR JUNE BEARING and EVER BEARING STRAWBERRIES: Before the first hard frost sets in, cover your strawberries with 4-6 inches of straw and cover with a wire mesh of sorts to keep the straw from blowing away during the season. Mulch, mulch, mulch and more mulch. Rhubarb: Mulch with organic matter and well rotted manure. Asparagus: Mulch with 4-6 inches of chopped leaves, hay or straw. 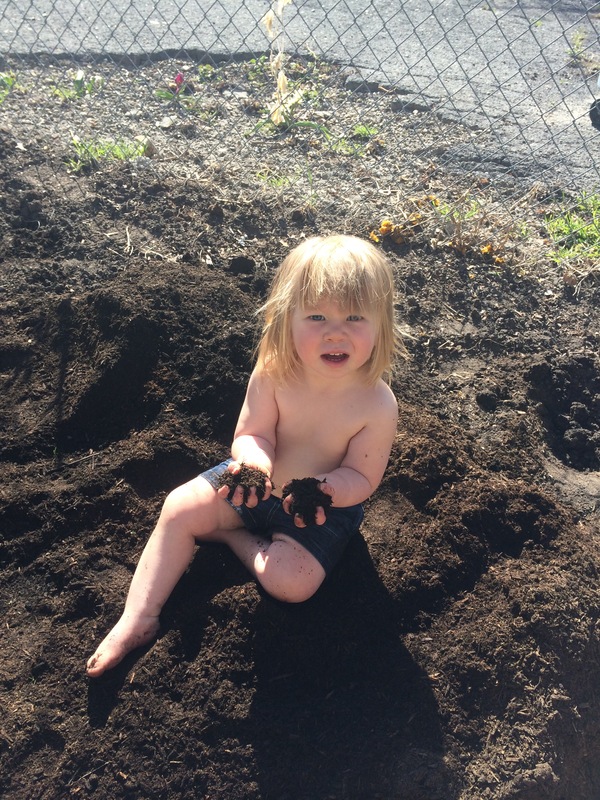 Remove the mulch in the spring. Horseradish: Mulch only if you live in particularly harsh areas. Otherwise no mulch is needed. Garlic: Mulch with chopped leaves, grass hay or alfalfa. 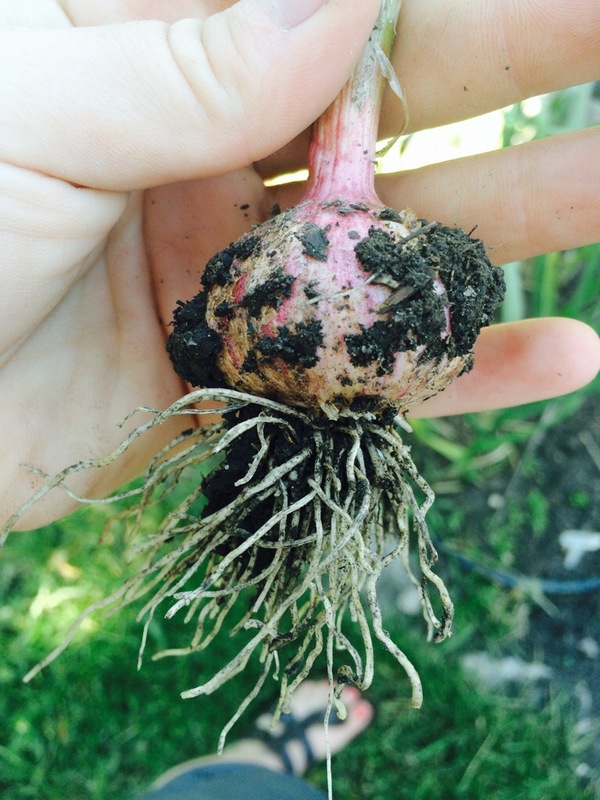 Avoid grain straw if you can which can host curl mite that can attack garlic. Instead of closing up shop after clearing out all the summer plants, plant something that can grow and keep your garden alive. Kale, collards, leafy greens, garlic, rhubarb, shallots and carrots are a few great things that you can start late in late summer and harvest in the fall. Your garden can also work as a great ‘root cellar’ of sorts, to store things like carrots, potatoes, onions and cabbage. Just burry in a few inches of soil and place a marker over the spot so it can be easily found once winter sets in. 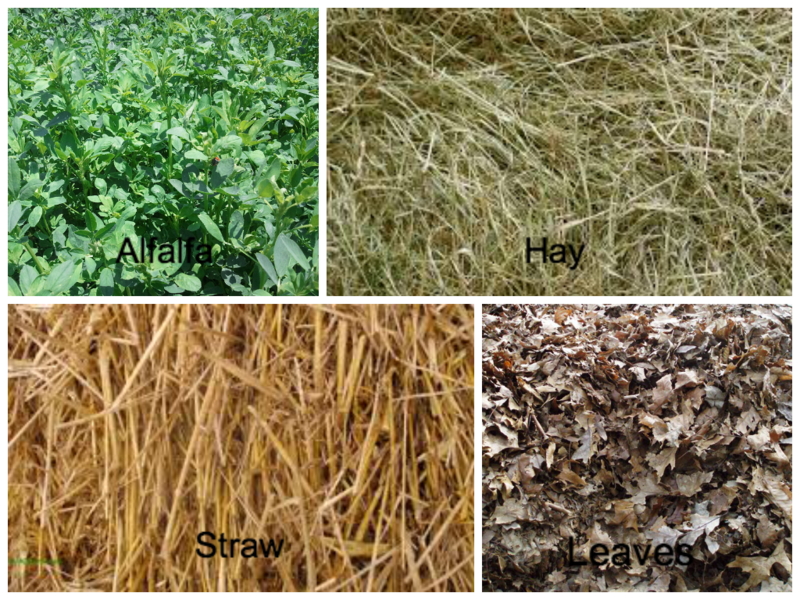 Something else to consider are cover crops! 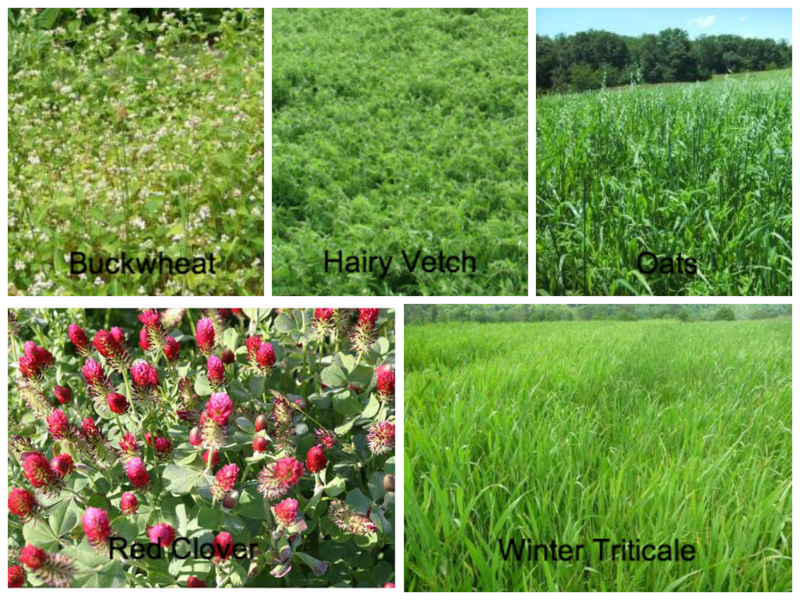 I have never done a cover crop but I really want to try one this year. I love that they keep your soil healthy and in place.